If you’re a PC performance enthusiast without severe budget constraints, you’re probably running an SSD in your system. Solid state drive prices continue to plummet, dropping below $0.22 per gigabyte on some 1TB models. While older systems may continue to run a secondary hard drive with rotating platters, newer systems, most users can get by with a single 1TB SSD. Alas, I’m not “most users”. 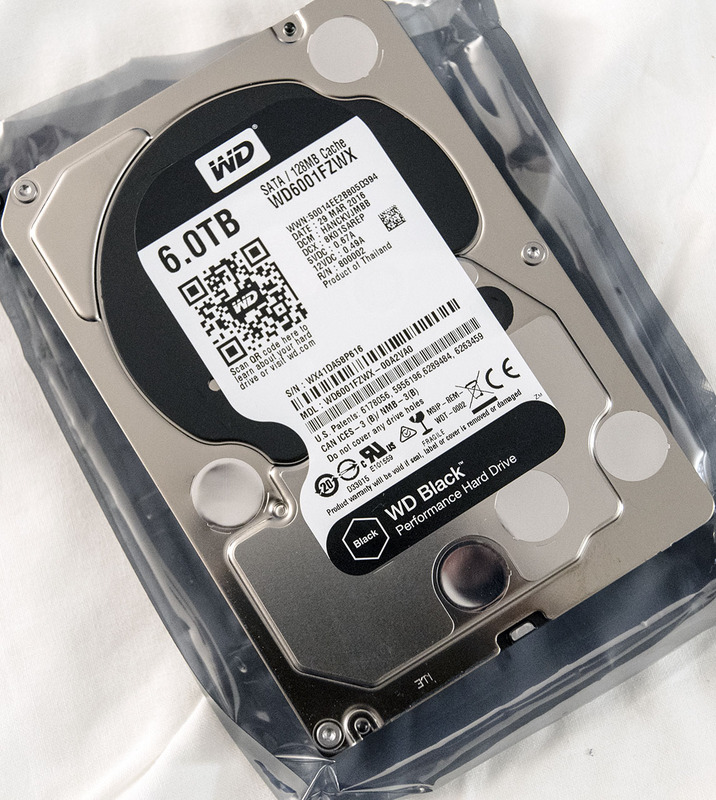 I just bought a Western Digital Black 6TB hard drive, which spins at 7,200RPM and includes a 128MB cache. The 6TB drive actually replaces two other drives, an aging 4TB WD drive and a really old 2TB Western Digtial model. Why on earth do I need a 6TB drive? In reality, I don’t — the 4TB drive alone would be adequate; I had two drives for historical reasons that no longer apply. On the other hand, the 4TB drive looked like it might need replacing. Lightroom occasionally rebuilds its catalog when you exit the program. I recently postponed the rebuild because my 4TB drive began making really weird noises during catalog rebuild, and seemed to take forever. A quick CHKDSK revealed no serious errors, but the noise and time to rebuild worried me. So I bought a new drive, and as I did, I thought to myself, why not 6TB? (This despite the fact that combining the 2TB drive contents onto the 4TB drive still leaves me with almost 2TB free). My pictures folder contains 1.07TB worth of photos, the documents folder is holds 242GB, and the downloads folder houses 1.3TB. Pruning some stuff out of the downloads folder would likely save 500GB, but that’s about it. I’m a digital packrat, with terabytes to fill up. The 6TB drive also runs faster than the older 4TB, at least according to Storage Review, so that’s a factor in its favor. The interesting thing about the drive, though, is its cost: $269, which translates to less than a nickel per gigabtye. It’s going to be some time before SSDs approach that price point. I also use hard drives in my NAS. 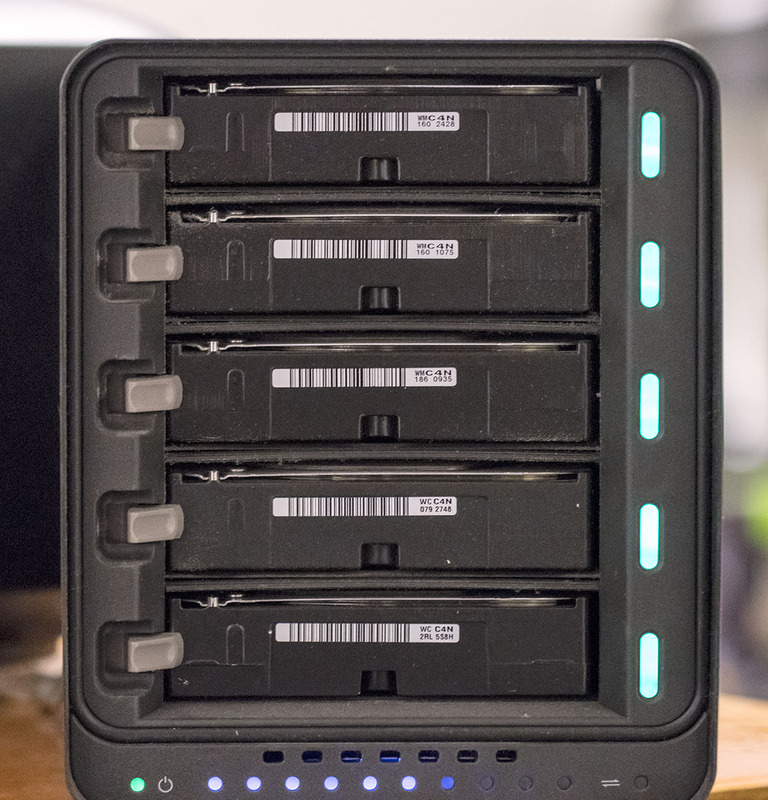 I’ve got a Drobo5n attached to my network, which contains five Western Digital Red 3TB NAS drives. Those drives cost even less, at a scant $0.04 per gigabyte. I’d hate to try to build a 15GB Drobo array with SSDs. Hard drive companies see the writing on the wall, realizing rotating media has a limited future. That’s why Western Digital bought Sandisk recently, and Seagate has acquired several flash-memory related businesses. Whether that will enable them to keep up with the aggressive likes of Samsung, who seems determined to push flash prices ever lower, remains to be seen. Hard drives still offer an edge in raw capacity, even for home users. If you have a lot of digital ephemera you like to keep on hand, nothing beats rotating platters for sheer capacity. However, those platters now purely store data. When I first started using SSDs, I needed to put games on the secondary hard drive. Now that I’m running a 2TB SSD, all my applications — including games — live on the SSD, consuming roughly 1TB of the 1.8 TB available. Some of the most exciting new technologies involve new ways to store data. Intel and Micron’s 3D XPoint may reshape the way we think of storage. 3D XPoint promises persistent, flash-like solid state storage at near-DRAM speeds. Imaging having a few terabytes of that on-hand. It’s likely to be a few years before we see 3D XPoint in consumer class drives, though. Meanwhile, if your storage needs are modest, go with an SSD. I need more storage than most users, so love the added capacity of a bit hard drive. Even so, I’m fervently hoping this 6TB hard drive I just installed will be the last set of rotating platters I ever need. Hi Loyd, I would have a look at Hard Disk Sentinel, it’s a nice piece of software that reads the S.M.A.R.T information directly from the hard drive, it’ll give you a better idea of the health of your hard drives.